May God grant you a blessed New Year in Christ Jesus our Lord and may you be filled with more and more of His Presence in 2019. We make resolutions that last a few days but God came down among us with a resolve, to bring us back to Himself. He did this in and through His Son, Jesus Christ. In Christ He finished the work of salvation as Jesus declared on the cross, "It is finished. 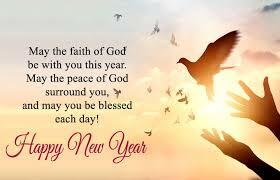 "Some begin the year with fasting and prayer. However you do it, may it bring you closer to Him this year. Nothing changes on New Year's Day but what we allow the Spirit of God to do in us permanently changes us. We wake up to a new year, yet the daily news is the same, hurt, war, crime, people hurting and thus hurting others. The world's the same. But in scripture something important did happen eight days after Jesus was born, the first of January on our calendar. You see, it was eight days after His birth that the baby boy of Joseph and Mary was circumcised. His blood was shed for the first time on this day. Shed to fulfill the requirements of God's covenant. Shed that He might be the perfect Son of God totally identified as one of us here on earth. Shed as a precursor to His blood being poured out on the cross for our forgiveness, for the world's life. His shed blood comes to us in His Holy Supper, not to cause us to mourn, but to lead us to rejoice that His blood brings us forgiveness, life, and salvation. In His shed blood we find our peace for the New Year and forever. May you and I feed on Him each day of the coming year and on till He comes! "Heavenly Father, pour out Your grace upon this new year, that we might ever be found covered by the blood of Your Son, Jesus Christ, our Lord. Amen."